Caption: Demonstration of gold panning as it was done in the mid 1800s when a gold strike in California set off the first gold rush in North America. Here, a guide posing as a prospector looks closely at a glass vial that holds garnets, a piece of sapphire and flecks of gold. Placerville, California, USA. Comments: Demonstration of gold panning as it was done in the mid 1800s when a gold strike in California set off the first gold rush in North America. 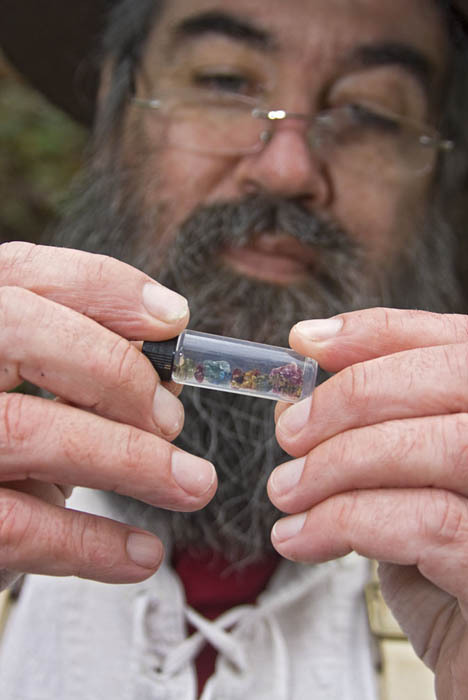 Here, a guide posing as a prospector looks closely at a glass vial that holds garnets, a piece of sapphire and flecks of gold. Placerville, California, USA.